Sylvia Seabolt | National Treasurer, Now What? 29 Jan National Treasurer, Now What? It’s hard to believe how much life has changed in the past year. I was officially elected Women’s Council of REALTORS®️ National Treasurer for 2019, my oldest son graduated High School, he in turn left the nest and is in college at Texas Tech, I was slated as the 2020 Women’s Council of REALTORS®️ National First Vice President, I was installed as the 2019 Treasurer and all that is just a tiny bit of what life has thrown my way. Oh…and I turned 40! In the midst of life, I have really been trying to focus on myself. I had been doing yoga basically weekly for several months and then decided to challenge myself to doing it for 30 days straight. Well, now I am on 63 days. When I set out on this challenge, I committed to complete 30 days. And then the 31st day came and I just kept going. My daily yoga teaches me something every single day whether I want it to or not. Sometimes it shows me I am stronger than I think. Other times it teaches me acceptance for where I am and what my body can do. And then still there are moments of victory when I nail a pose and you would have thought I just scored a perfect 10 in the Olympics. Will I do yoga everyday for the rest of my life? Who knows. I’m just taking it one day at a time. Yoga is not about being perfect because I am far from it. Yoga is about effort. For now, I’m going to continue to bring that effort everyday because there is a transformation happening. And gradually, gradually, suddenly…change will happen! You are probably wondering where I am going with all this…me too. One thing that keeps appearing in my life is inspiring and encouraging others. Whether I asked for it or not, I seem to inspire others with the authenticity of me. For someone that is very much an introvert, this has been a struggle for me to let others in and yet I can think of a handful of times that I have done it…like training for my half marathon, running for National Treasurer or even this latest yoga challenge. So I am committing to being not only more me, but allowing you to see more me in 2019. 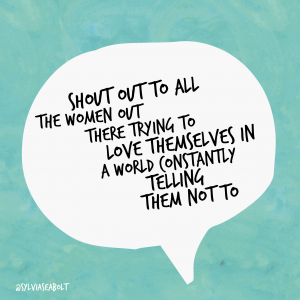 This is my official shout out to all the women trying to love themselves in a world constantly telling them not to…including myself! Follow my adventures on Facebook and Instagram or subscribe to my blog!